One can hardly see me running in a tee. Usually I wear running singlet. In our hot and humid weather, the less material the easier for the body to cool down and the sweat to dissipate. If I can, I will run without any top but I don’t want the ladies to faint from the shock and the guys to fall down in laughter when they see my bouncing one lump of belly. So you can imagine my consternation when I was given a running tee when I joined TNF Trail Run series. 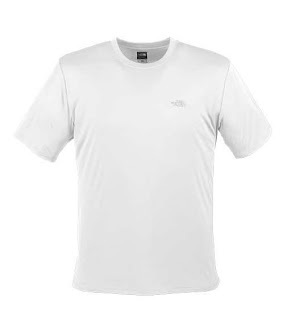 With the hydration bag already weighing me down, and trapping the air on the back, how was I going to run in a tee? But my fears soon turned out to be unfounded. We were given a TNF Veloci-Tee. The guys in white and the ladies in black. And it was an amazing piece of tee. The material was so soft it was almost like silk. According to the website, it feature a velocitee fabric and is extremely light weight. It comes with the vaporwicks technology which promises to wick sweats away from the body to the surface of the coat for it to evaporate fast. And indeed the tee dries faster than any other shirt I ever worn. And because it was so soft and light, I hardly even felt it. The only blemish about this was the sheer thinness of the material means whatever was underneath could be seen clearly when it is wet which means…….. Apart from that, it is a quality piece of tee and I would highly recommend it for daily run and wear. One other detail - the sizing are not for Asian, so those wishing to get this should get one size smaller. TNF Veloci-Tee is available at TNF stores at Marina Square and Ion Orchard.